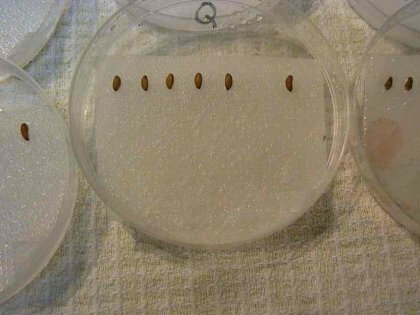 This is about a method to start the germination process that will get your Pelargonium seeds to sprout prior to planting them into a seed-raising medium. The advantage is, that nearly all-viable seed will germinate within 7 days from the time the process is started, giving more control on when you have your seedlings growing. It also minimises the time and effort used on the non-viable seed – because these individuals will be identified at an early stage. Remove the seed from the mericarp. That is, take off the husk with the feathery tail. Insert a needle and slit side of husk. It is then possible to tear open the husk and let the seed fall out. 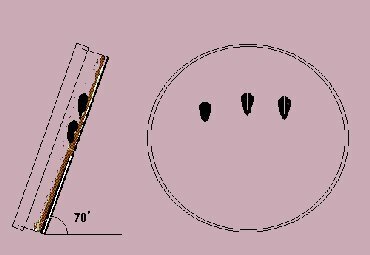 Scratch the seed case on a vertically central line, on the rounded side (cotyledon side), starting from a point as far as possible near to the bottom point and continuing to the top centre point of the seed. (Diagram A) Scratch sufficiently to get through the hard skin, but try not to go deeper. It is easier to control the seed for scratching if it is held on moistened paper towel. It doesn’t slip around as much. After scratching. Place the seeds in a small container or petri dish on a single layer of paper towel. Align all the seeds in the same direction. There is no need to cover the seeds with paper – add sufficient boiled but cool water to saturate the paper towelling – making sure the seeds are flooded. (A 500 ml hand spray with 0.5 gm/L of Phostrogen is beneficial for watering or rinsing the germinating seeds). Replace the lid. Stand the petri dish so that the base is about 50 to 70 degrees to the horizontal (Diagram C) and rotate the dish so that the pointed end of the seed is downward (Diagram B). Any excess moisture will trickle out, leaving a small reservoir at the lower point of the dish; this will be absorbed as the paper towelling begins to dry. Make sure the paper towel reaches down to this area to be in contact with the moisture. Keep shaded and within a temperature range of 21 to 24 degrees Celsius. The higher temperature is preferable. 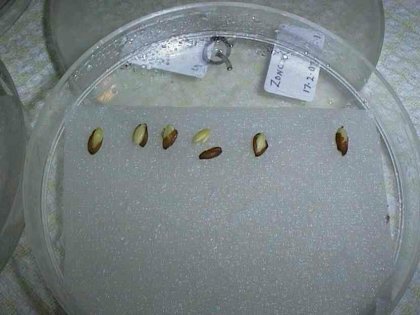 The scratched seeds usually become swollen within 3 hours of saturation and the seed case will commence to split open where it was scratched. If a seed has not swollen and split, it may be because the scratch was not deep enough to allow moisture penetration. At this point, it may need a very sharp needle to lightly scratch the softened seed case. Alternatively, test the seed case, if it is still rock hard, then re-scratch a little harder and deeper. Maintain moisture level — do not allow the absorbent paper to dry out. After each inspection, use the hand spray for rinsing the seed, tip out surplus water – the seeds do not fall out. Re-set as in Diagram C.
After 24 hours. Carefully fold open each side of the seed case where split, so that there is no restriction to the swelling of the seed or to its growth movement. 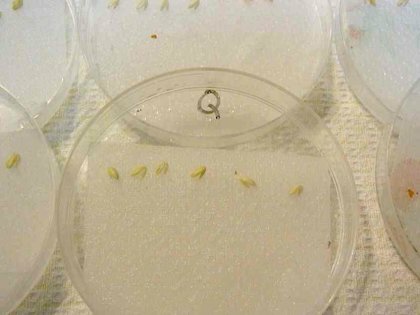 After 48 hours, the seed case should be removed – Some seeds need to have this further coaxing to trigger a germination response – given by the removal of their seed case. After some practice this becomes much easier. Spray the naked seed with clean water and re-set as in Diagram C. Rinse these seeds at least twice daily to wash off any toxins that may develop. This can be done easily by giving each germinating seed a watering from a hand spray. Any non-viable seed will quickly become soft and putrid. An unmistakable odour that you will need to get rid of. When the rootlet is about 15 mm long and the seed leaves are opening out, the seedling can be potted up in a pasteurised seed raising mixture. After filling the pot with soil, water the soil/medium and dibble a hole just prior to transferring the sprouted seed. Gently close the medium onto the rootlet. The medium around the rootlet can be finally closed around the radical with the help of a few squirts from the hand spray. During the last 12 years, 99% of my 3500 seedlings have been started with the Scratch Method. This method has given good results but does require extra care and patience. Experiment with some less important seed first. 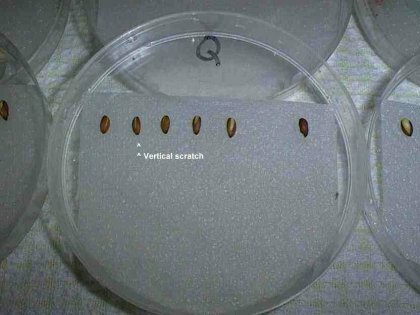 Do not use this scratch method for planting seeds in the traditional way.